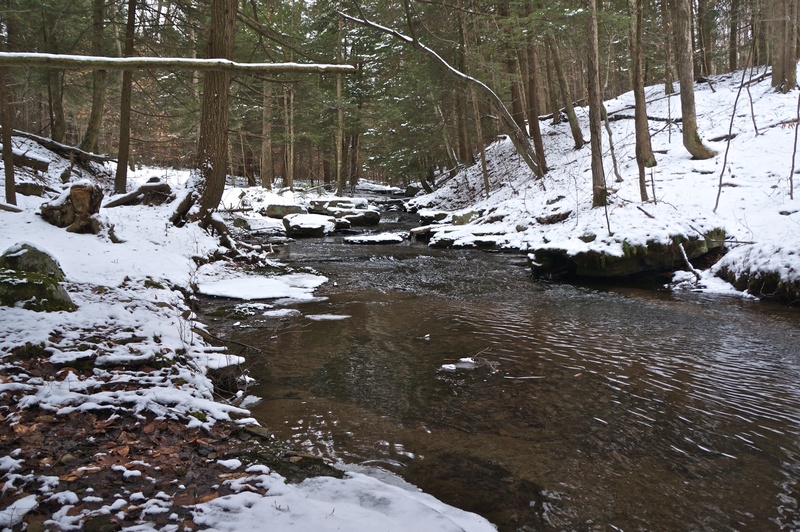 Despite knowing we might run into some lingering snow from the unrelenting winter, Stubbs and I headed north to Big Pocono State Park in Monroe County, PA for a short day hike. We parked off of Railroad Rd at the parking area known as Riday’s Gate. I’ve done this hike a few times and have never seen more than one car at this parking area. 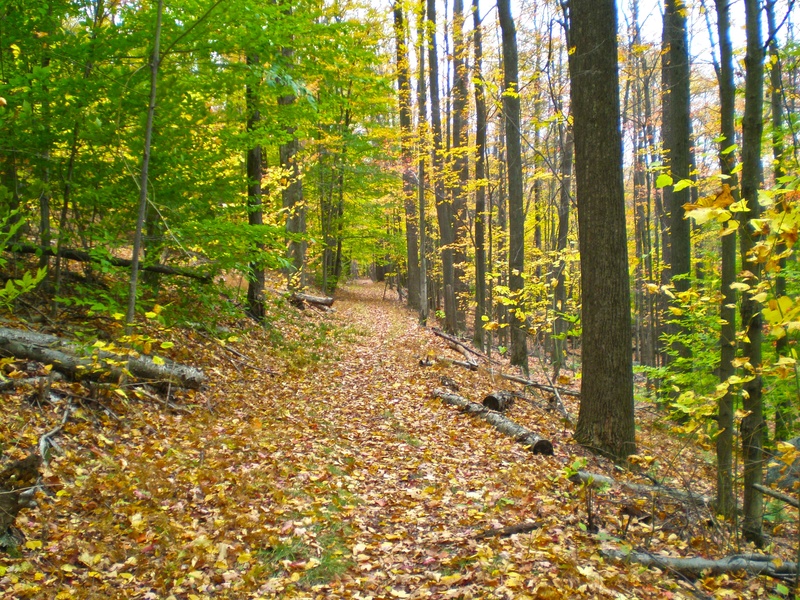 The first 1.5-2 miles of the trail is along an old railroad grade. Even though the trail is steady uphill, the gradient is easy and the hiking was pretty fast. We did reach a 1/4 mile or so where the trail became part of the runoff of the mountain. 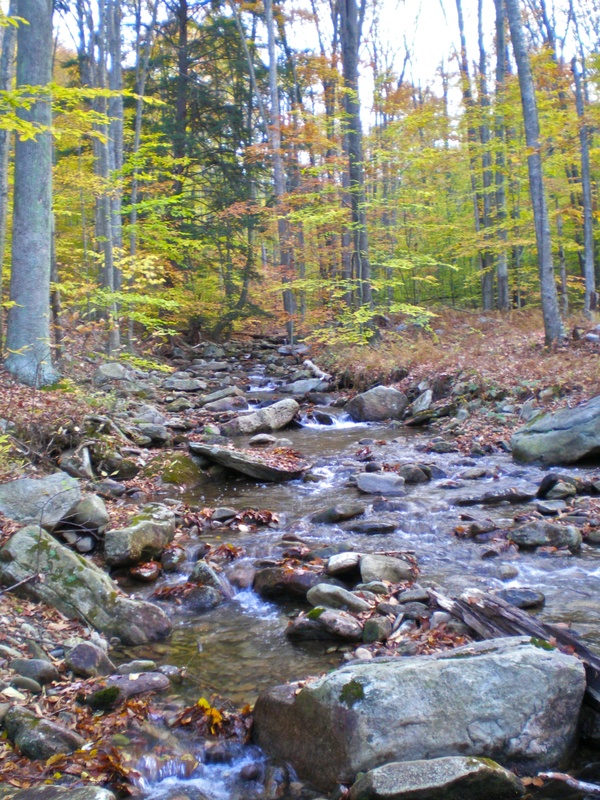 We declared this new trail stream/hybrid a strail (stream + trail). We reached the intersection of the North and South Trails where there is a register. We signed in and I found the page from when I was there in October. 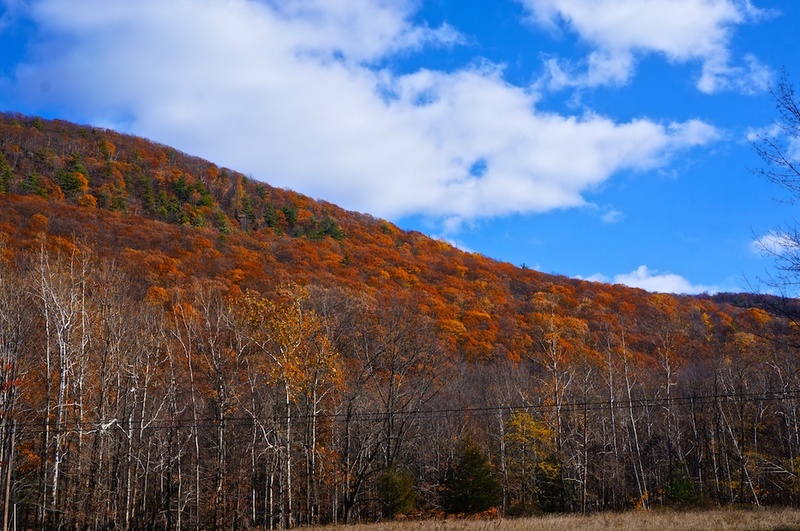 That day was in the low 70s with beautiful sunshine and near peak foliage. This day in late March was grey with highs around 35. We decided to take the North Trail up to the top of the mountain. A decision I question knowing what I do now. 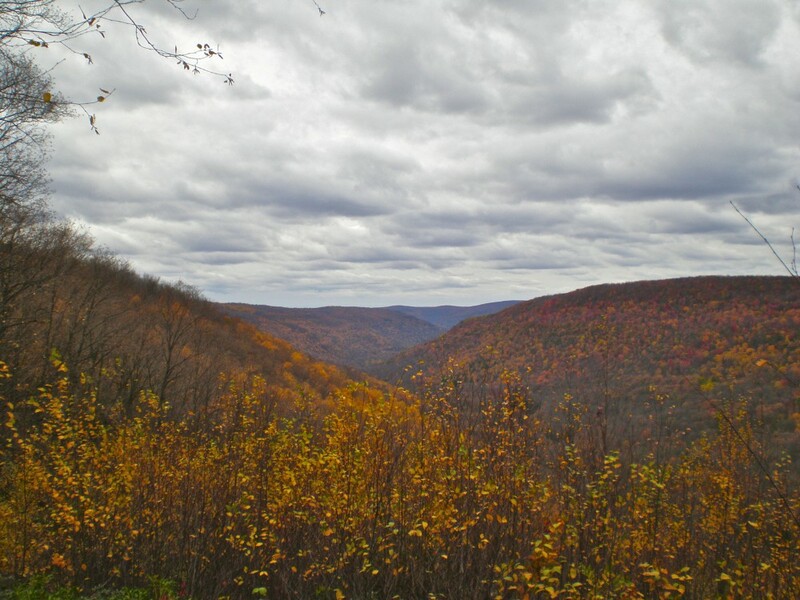 After the split, the North Trail moves through a beautiful area where cliffs grow on both sides. We’d hiked this way in the winter a few years ago and found traces of snow in this area. Today we found snow 6-8 inches. 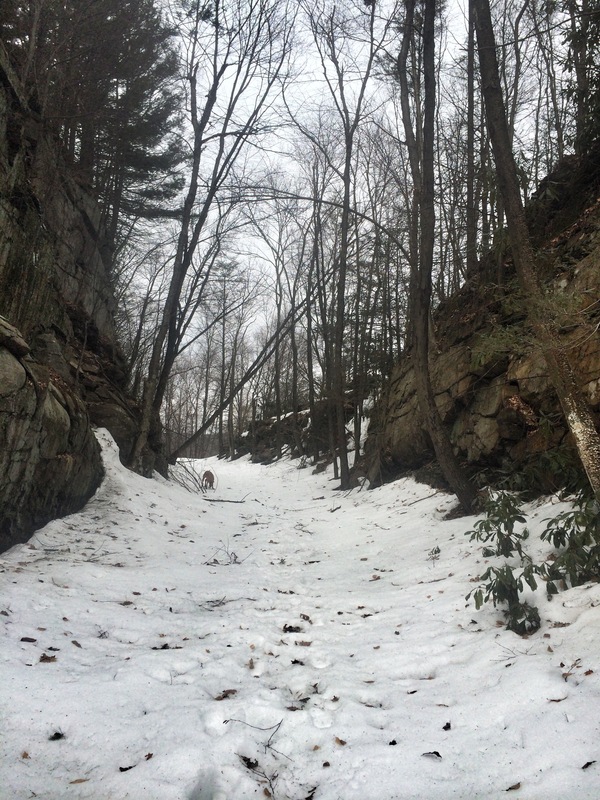 The trail continues on and gradually makes it way up the mountain on old railroad grades. As we gained elevation, the snow grew deeper. At some points, drifts along the trail measured well over a foot and probably close to 18 inches. We were gracious that someone had previously hiked our route in snowshoes. We were forced to trace those steps on steep sections. My friend’s dog failed to see why we were struggling. The North Trail eventually butts right up to one of the ski slopes of Camelback Mountain. We paused and caught our breath as skiers and snowboarders coasted past on early spring snow. One last push up a steep trail with icy snow granted us the amazing views from the top of Camelback Mountain. 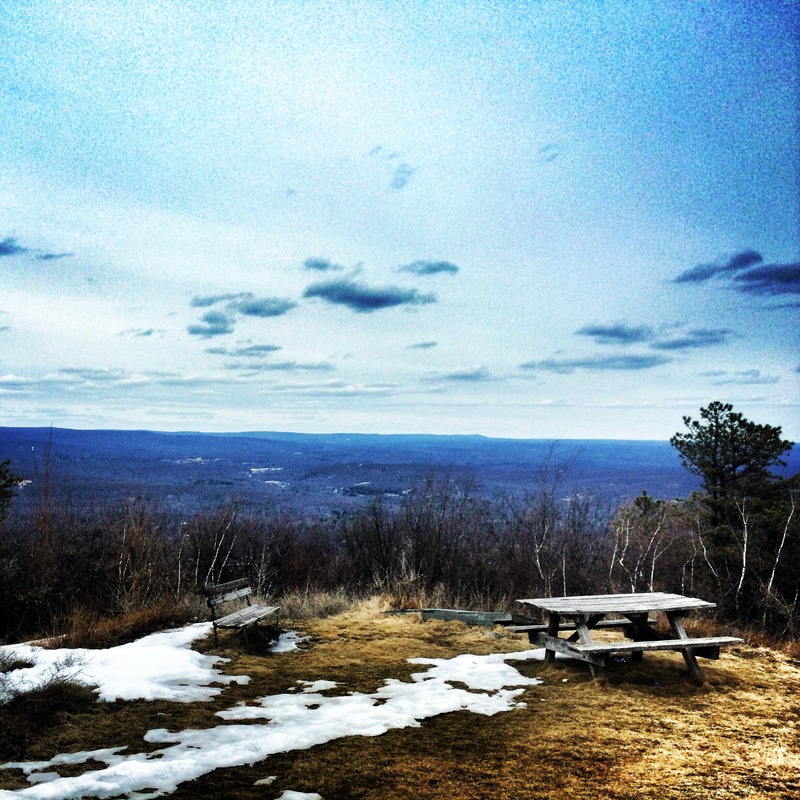 There is a picnic area on the top of the mountain that you can drive to during warmer months. But the seasonal road to the top was closed and we had the peak all to ourselves. 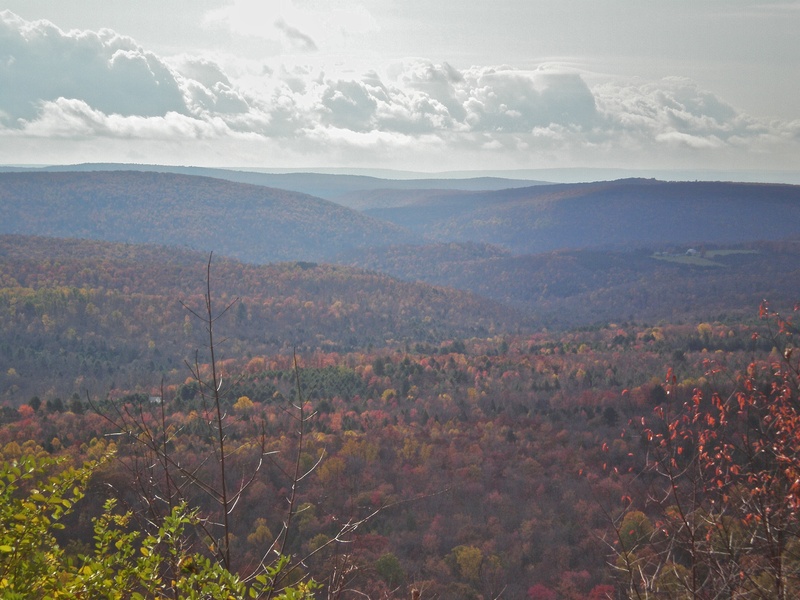 We stopped for a short while at a picnic table that looks north over the Poconos. 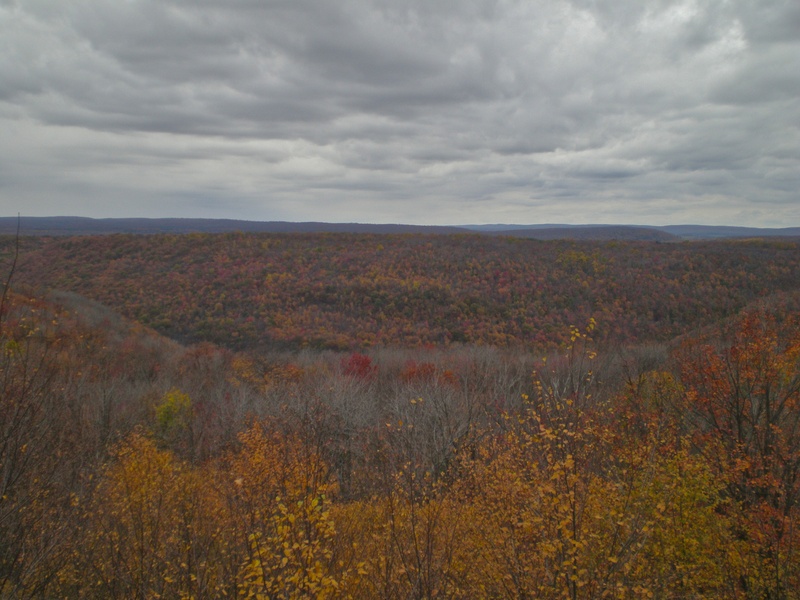 The view was nice, despite the grey skies and stiff wind. Interpretive signs warned that the mountain had a healthy rattlesnake population (which I do not doubt) but we laughed thinking of the snakes still warm in their dens. We continued on and made our way to the top of the mountain, where 360 degree views greeted us. The sky was a light, indifferent grey and it even flurried for a few moments. 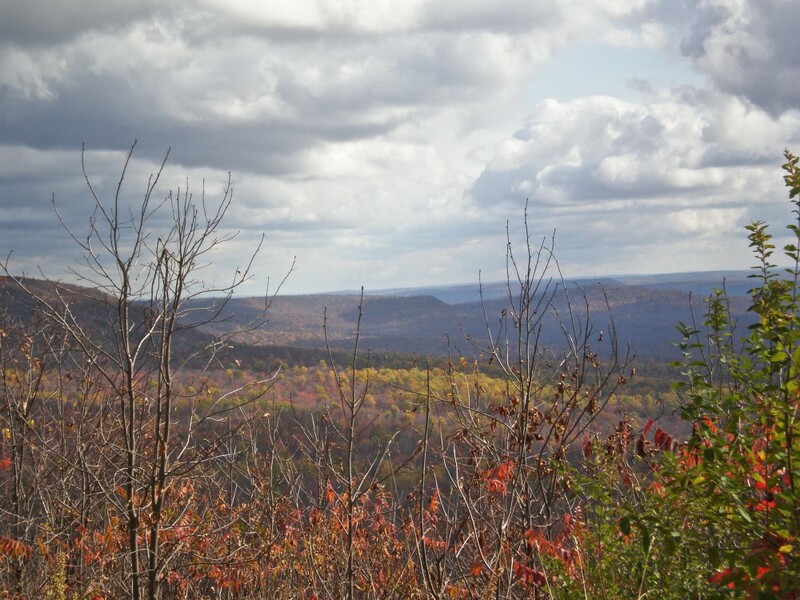 We stopped at a bench with a nice view to the west of the mountain to have a snack. But it was a quick break when the wind picked up and blew regularly at what felt like 30-40 mph. My friend and I had both broken a sweat on the last steep inclines to get the top and the cold wind went straight through the both of us. We did not linger longer than to finish our snacks and snap a few pictures. We made our way back to the trail from the parking area and started to slowly descend the mountain. 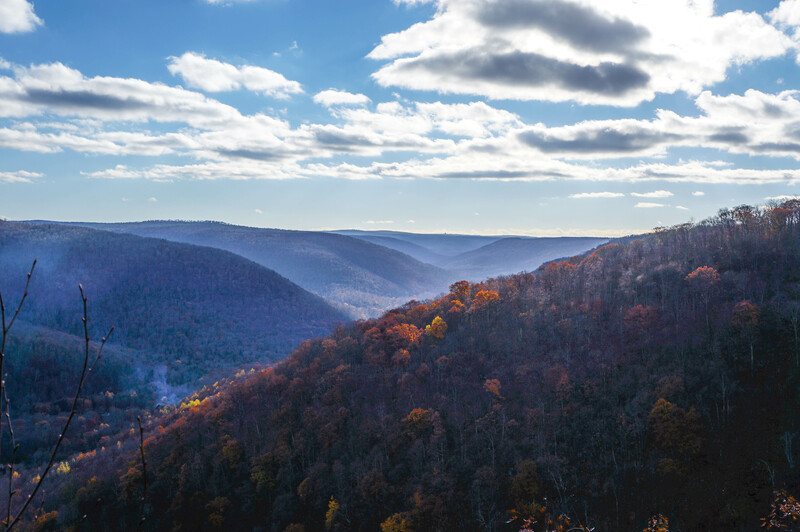 With my friend having to be home early for a previous commitment, we were short on time and skipped the hike on the Indian Trail to the beautiful view that looks east toward the Delaware Water Gap. The South Trail was almost a completely different experience than the North Trail. 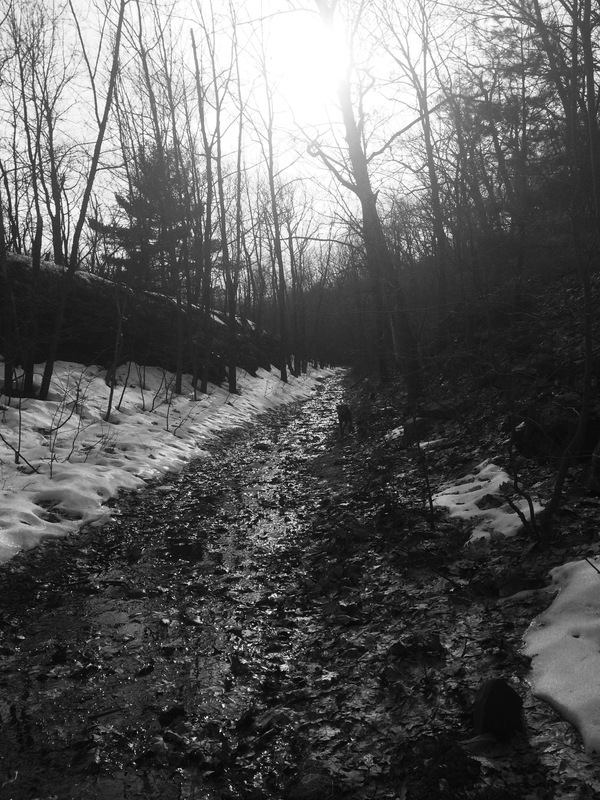 The path had clearly seen considerable more sun and was more or less free of snow. We moved quickly down the mountain, going probably close to twice the speed as we ascended. 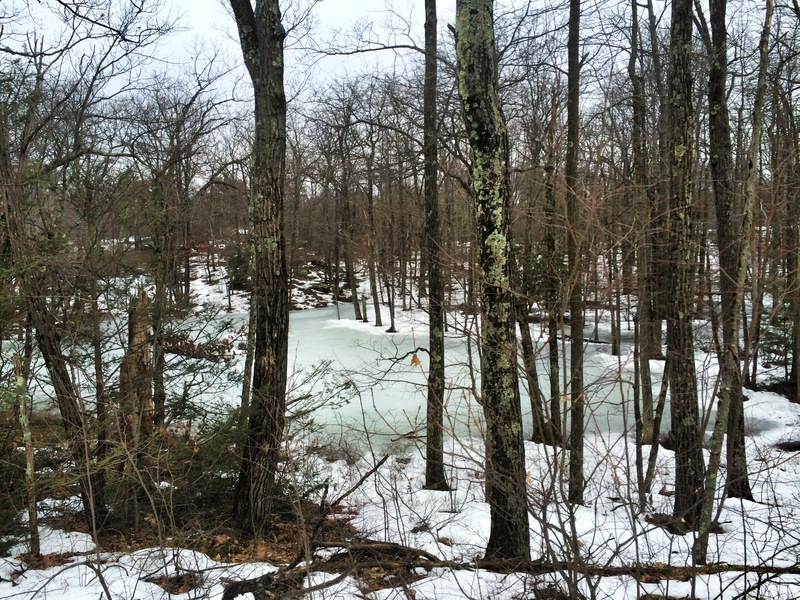 We reached a low point along the trail where a pond had formed and then frozen over. The ice was still relatively thick, despite the obvious sunlight the pond had seen. We reached the intersection we passed earlier with the register. The slow downhill along the occasionally wet railroad grade followed. The sun tried to make an appearance as the day wore on, but was stunted by low clouds. We did about 6 miles in the end, with the North Trail feeling about twice as difficult as the South Trail. 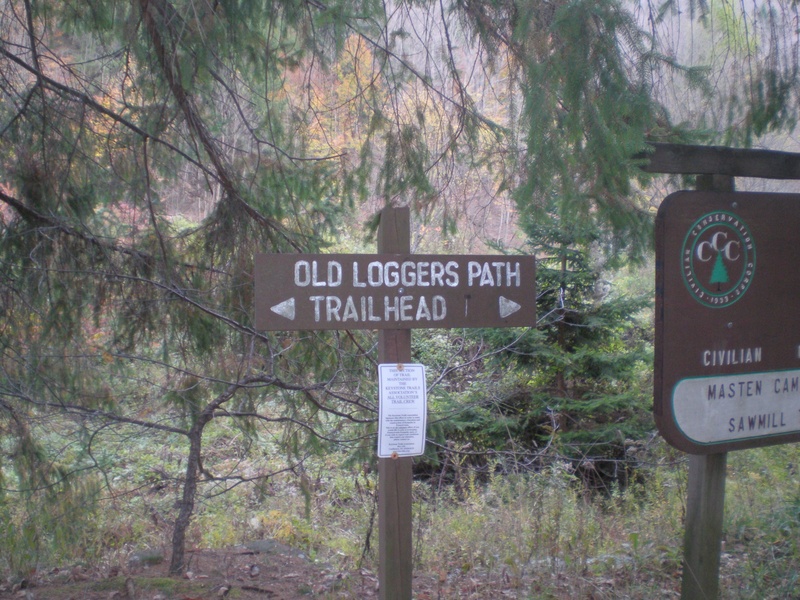 I’ve hiked this area a handful of times and have seen a grand total of three people on the railroad grade that leads to the “official” trail system of Big Pocono State Park. While the areas on the top of the mountain are usually crowded during warm months, the trails leading to the top are fairly deserted. This will probably always be the hike that I remember more for the car breaking down on the turnpike on the way home. 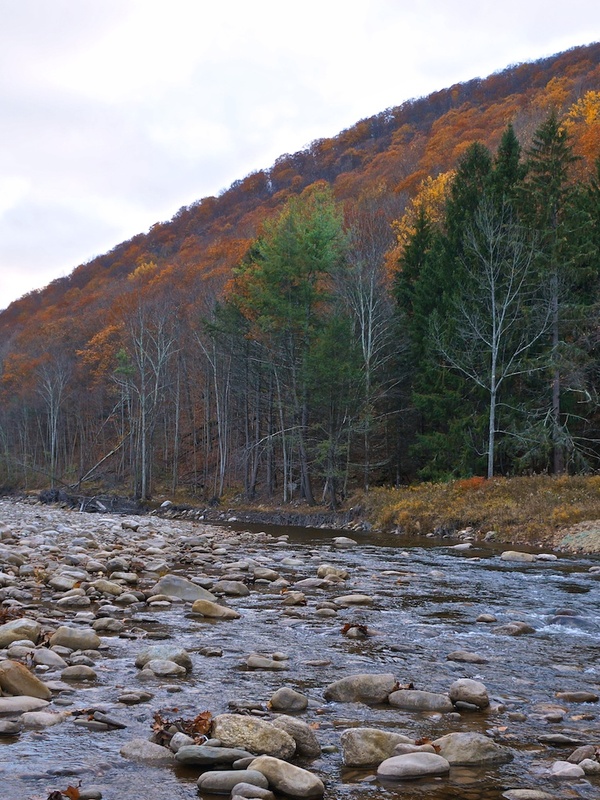 But a few hour detour in Lehighton did nothing to diminish the experience of our trek through the Loyalsock. 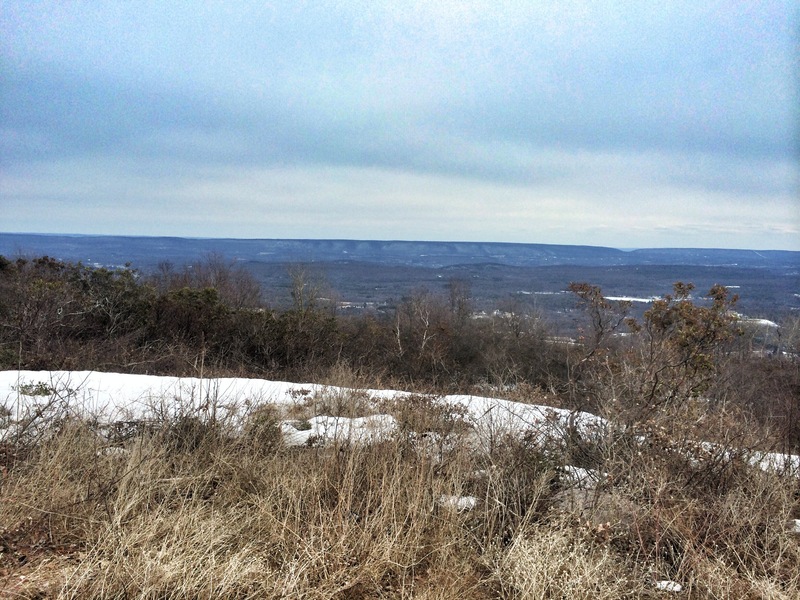 We started our hike from the parking lot along High Knob Rd where it meets World’s End Road. 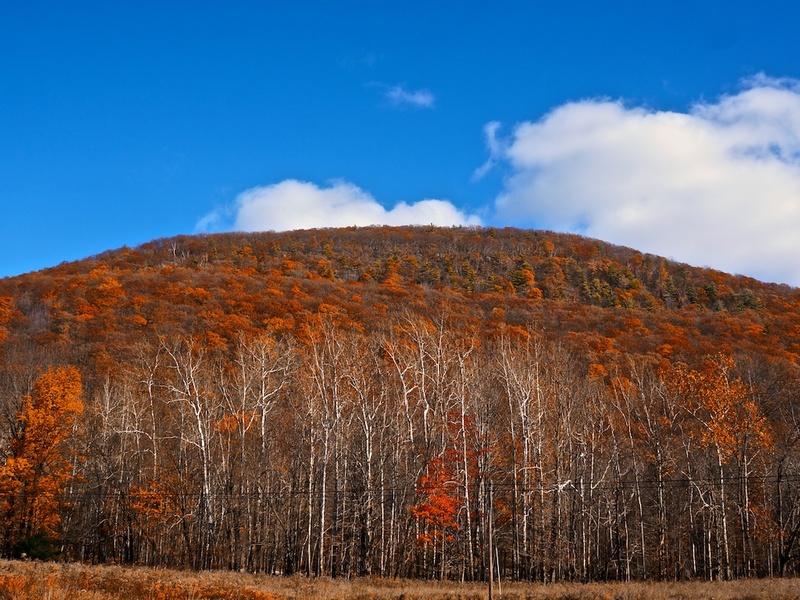 (High Knob Rd is closed to traffic in the winter, but the parking lot is accessible.) About 2 inches of soft, crunchy snow covered the ground. The weather was pretty mild for January in PA, almost 30 degrees. It was the Monday of MLK Day and there were no other cars in the lot and we saw no one all day. 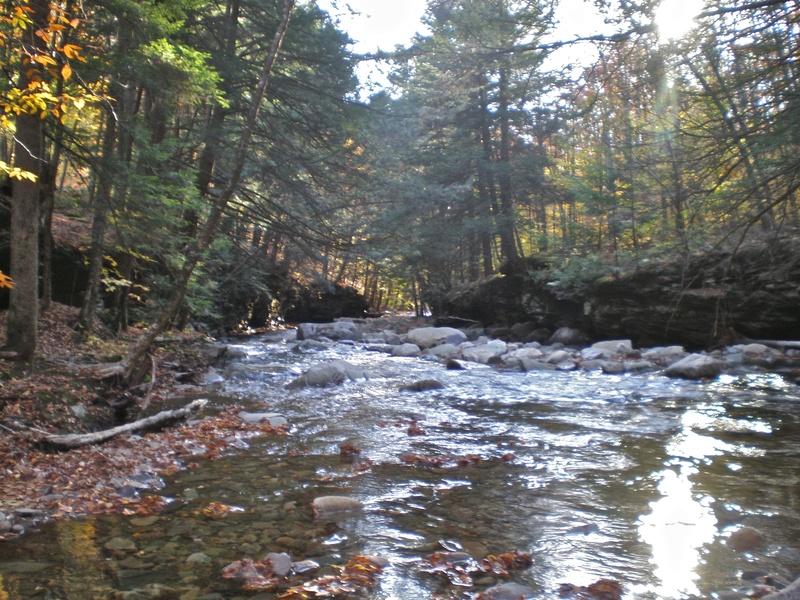 We set out on the Fern Rock Nature Trail and soon crossed over the east branch of Ketchum Run. 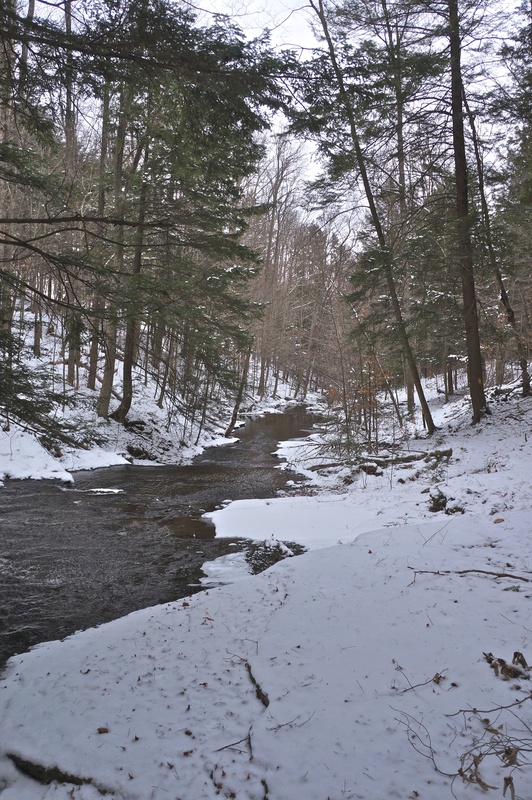 The creek gurgled under the bridge and snow and ice covered the banks. It was quite serene. After about a mile of hiking, we reached beautiful Ketchum Run. 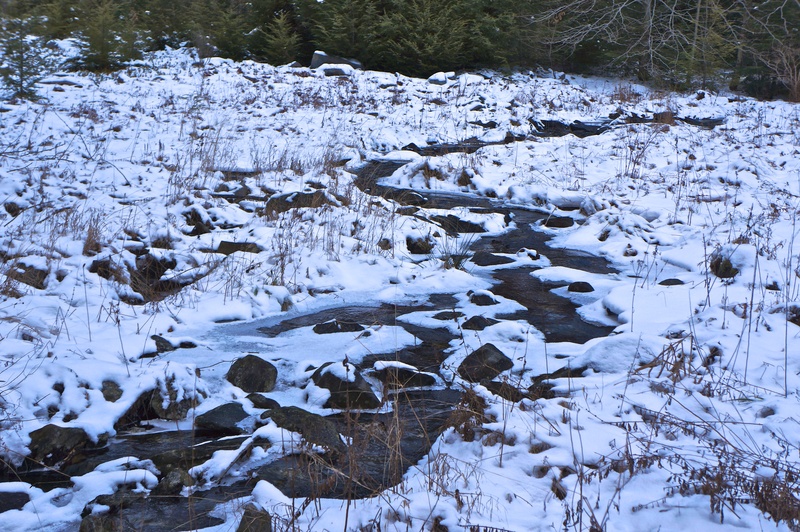 Thick ice covered the banks but the stream flowed quietly through the forest. We turned right and followed the stream north, still along the FRNT. We met up with a cross cross country ski trail for a few minutes before reaching a red blazed bridle trail. 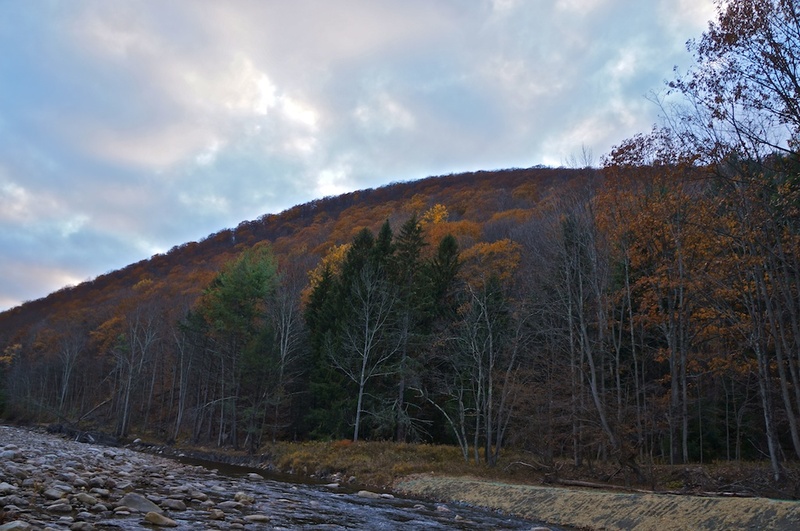 This trail crosses Ketchum Run and eventually meets up with the Loyalsock Trail. The trail crossing was impossible, with a layer of ice covering the entire stream. 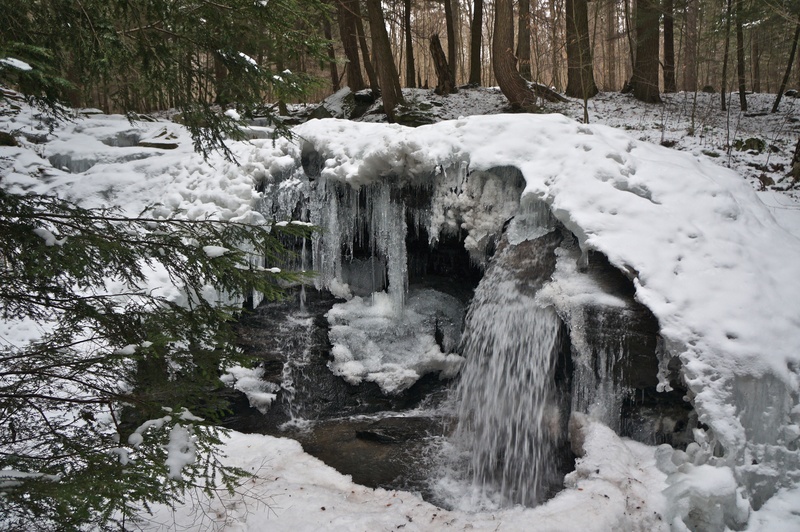 In some places, the stream tunneled under the snow, completely out of sight. We continued along the bank of Ketchum Run. 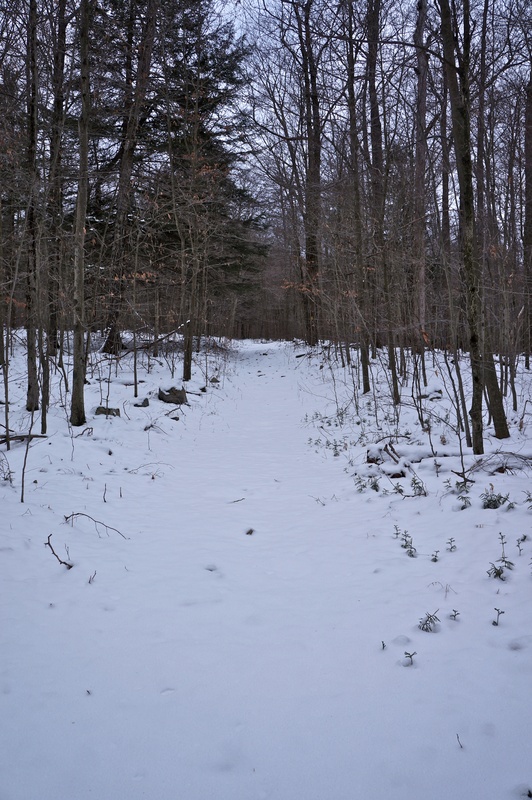 There is no official trail that follows the run, but a path through the woods is fairly obvious. We soon reached a 10 foot high waterfall. 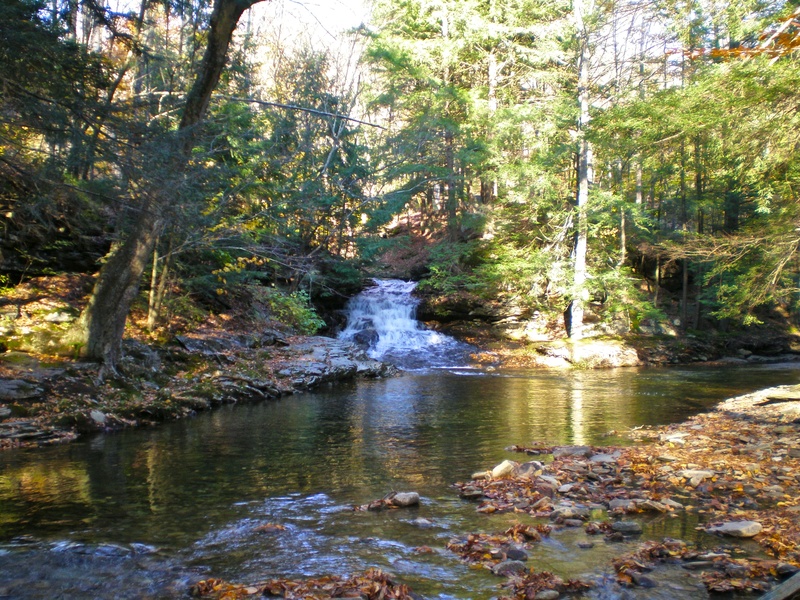 When we were here in the summer, you could hike all the way into the run and right up to the falls. Today, we were forced to take pictures from further away, as thick ice blanketed the falls. Further down the run, we came to the top of a 20 ft falls. The top of the falls was completely frozen over. We climbed down to the bottom. Large icicles encased flowing water at the base of the falls. 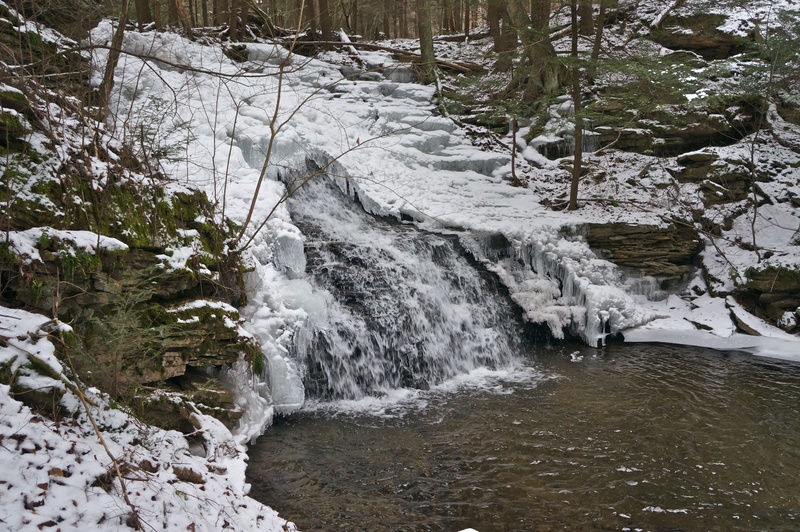 The Loyalsock Trail is only a short walk from the second waterfall and we hiked on to that spot. 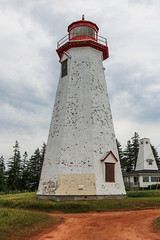 There is a nice campsite here, though it looked as if it had been some time since its last use. From here, we retraced our steps (easy to do when yours are the only ones visible in the snow!) back to the FRNT. We took the north side of the trail on the return trip. The east branch of Ketchum Run flowed quietly nearby for the final mile. There was only one visible set of footprints in the snow outside of ours along the FRNT. We saw numerous animal prints though, including deer, what appeared to be hare, and even bobcat tracks near Ketchum Run. My friend’s car is back running. He was even so kind as to supply the videos seen here. Check out his photography. 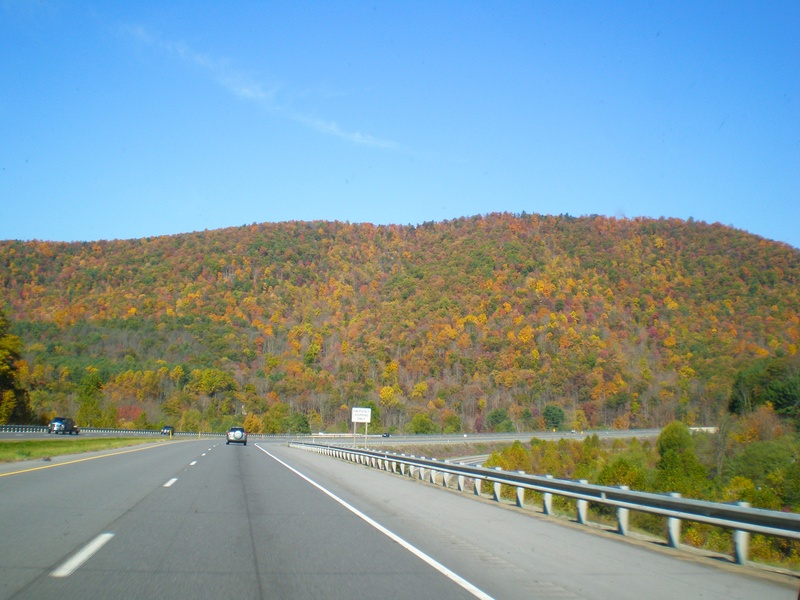 We actually set out to return to State Game Land 13 in Sullivan County, but changed course when we hit Route 80 and saw the pockets of color still left in some of the trees. 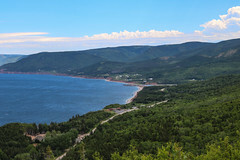 Wanting to find a good view, we decided to head to a part of State Game Land 57 that we had not yet explored but wanted to for some time. A slight mistake in navigation had us approaching the trail head along SR 3001/Windy Valley Rd from the west – something I do not recommend unless you have a car with 4 wheel drive. 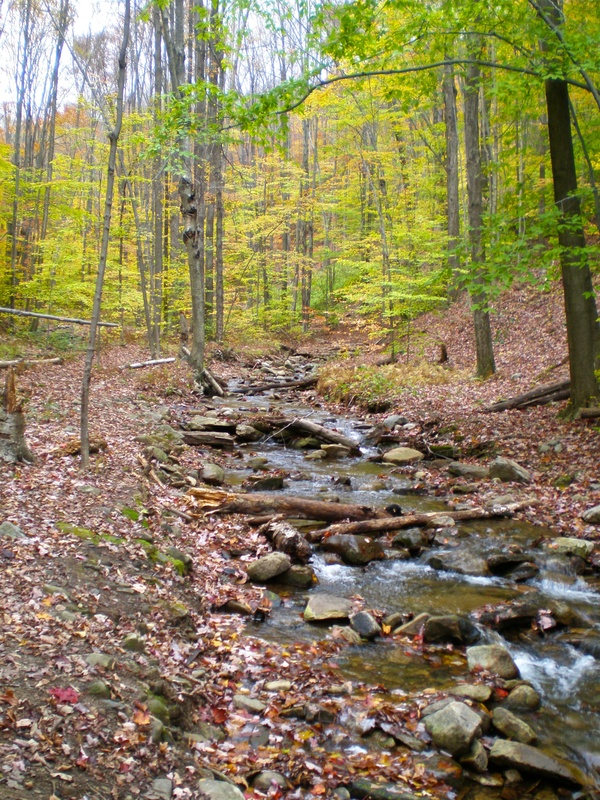 The road descends down to the Mehoopany Creek on an unpaved path through the heart of SGL57. It is very beautiful, but the road is quite precipitous. It is much easier to access this area from Rt 87 in Forkston. We parked in the game commission lot just south of White Creek. The leaves that did have color stood out brightly amongst the greys and browns of the trees that had already lost their leaves. 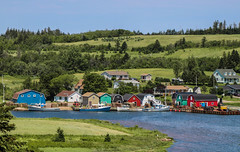 The trail meanders past a handful of cottages along White Creek following the boundary of the game lands. We headed steadily uphill for close to 3/4 of a mile. 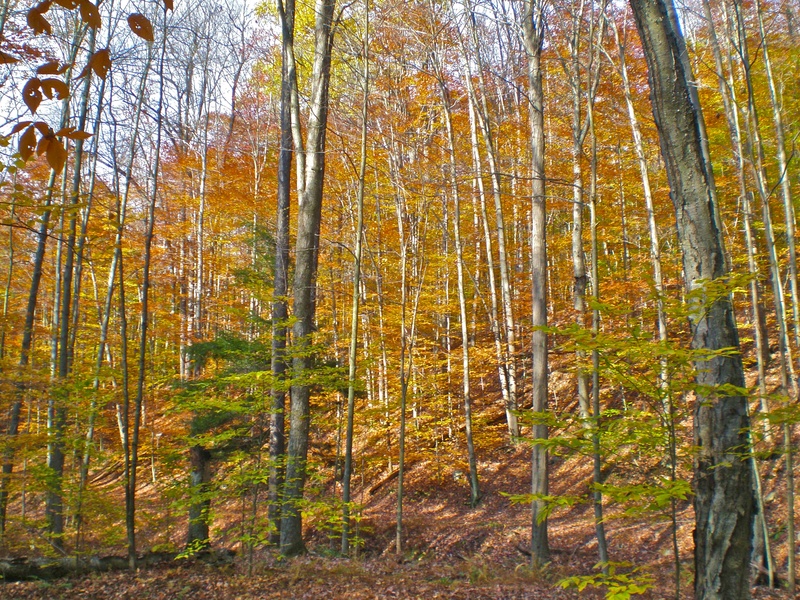 Many of the leaves were already down, but there were still some pockets of bright yellow, particularly at the lower elevations. The trails here are not blazed, but are fairly obvious as they move up the mountain. We reached the point where the trail heading west continues on when a trail comes in from the left. A street sign (with plenty of bullet holes in it) that says “Watch for Stopped Vehicles” marks the turn. Seasonal views to the south and east appeared through the trees as we continued a steady climb to the top of Bartlett Mountain. The unmarked trail switchbacks a few times before reaching a steeper section that juts up among bigger rocks. 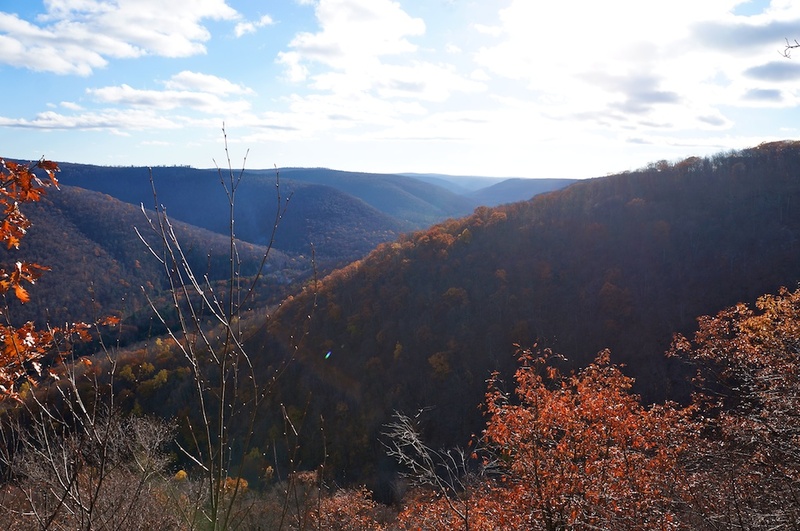 We reached the top of the mountain, where we cut through some low brush to a stunning view over the gorge of the Mehoopany. With the exception of a small cottage at the foot of the mountain, the view is completely untouched. My photos don’t do the view justice, as I was shooting almost directly into the setting sun. 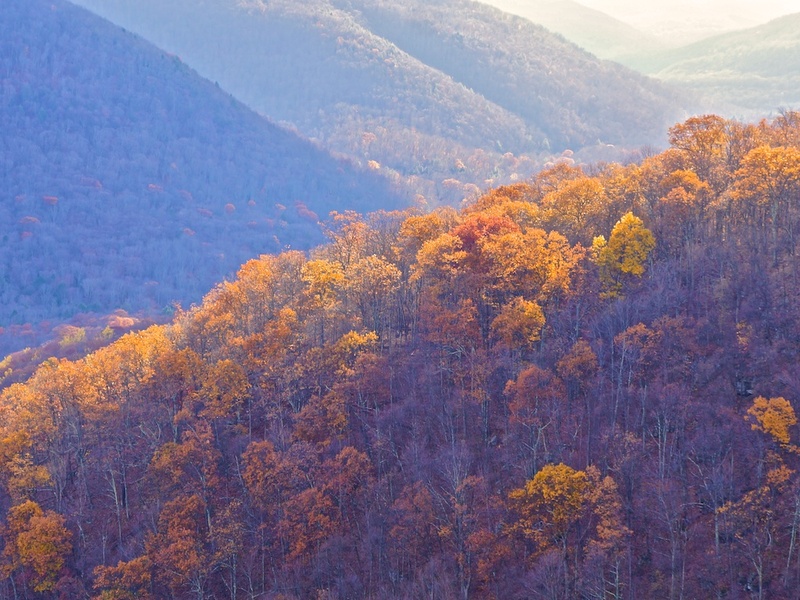 The pockets of color stood out amongst the bare trees as the sun set over the valley. 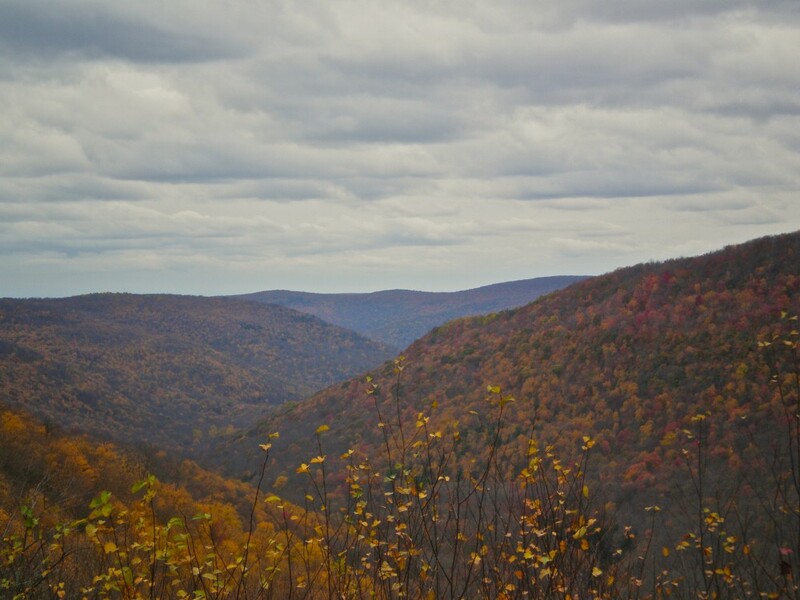 The cold wind rustling the trees was the only sound as we took in the view, reveling in the solitude of the setting. We enjoyed the view for a few minutes before starting our descent back down the mountain. We were treated to more limited views as we descended steeply. The freshly fallen leaves covered slippery rocks and hidden crevices and both my hiking partner and I almost lost our footing a number of times. 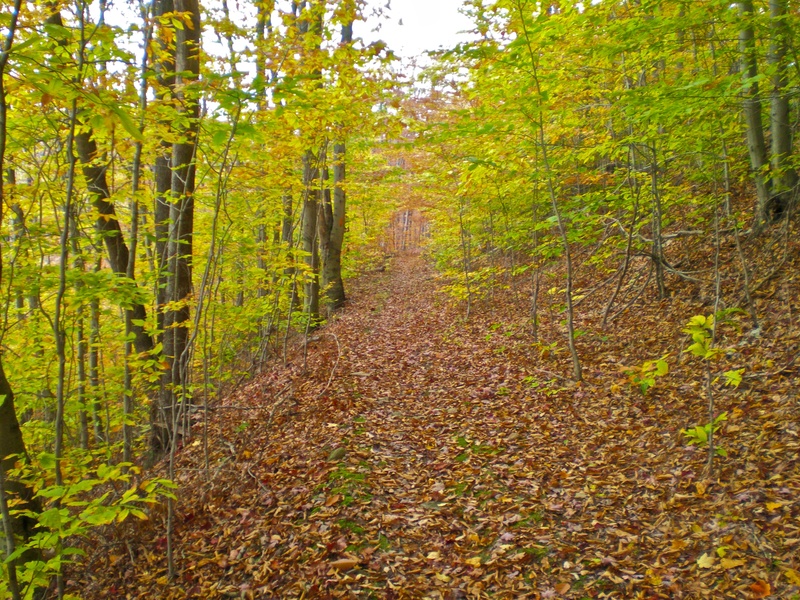 Hiking on the leaves was quite the cacophony with two people and a 70 lbs dog, so I did not expect to see much wildlife. But we did see a turkey on the ascent and a white tailed deer on the way back down. I’ve read of bears and rattlesnakes both being active in this area. We descended back down to the Stopped Vehicle sign and then even more steeply down the main trail as we returned to the car. 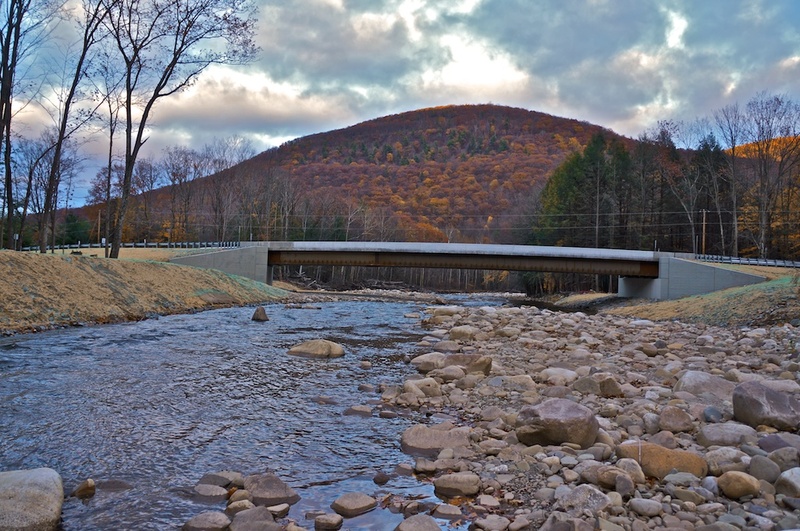 With limited light left, we drove quickly to the new bridge over the Mehoopany. 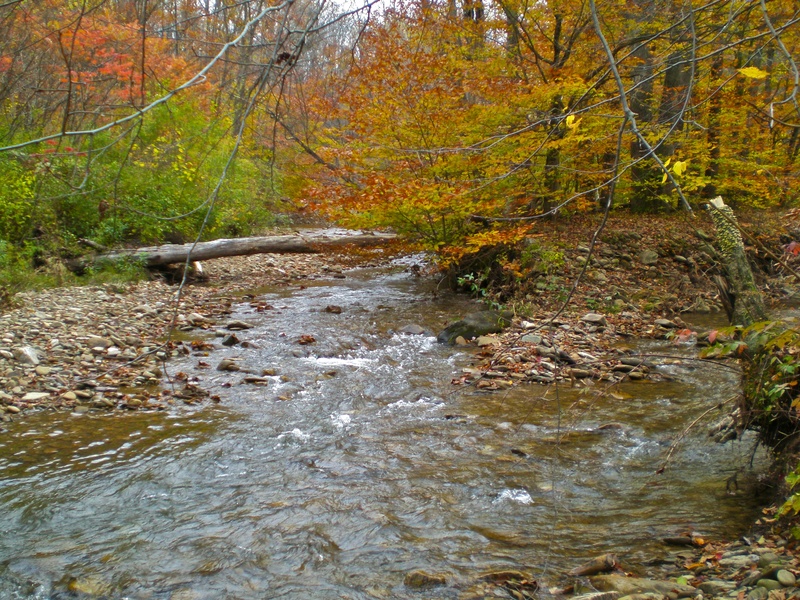 The creek was ravaged by flooding during Hurricane Irene in 2011 and a large floodplain is still evident. 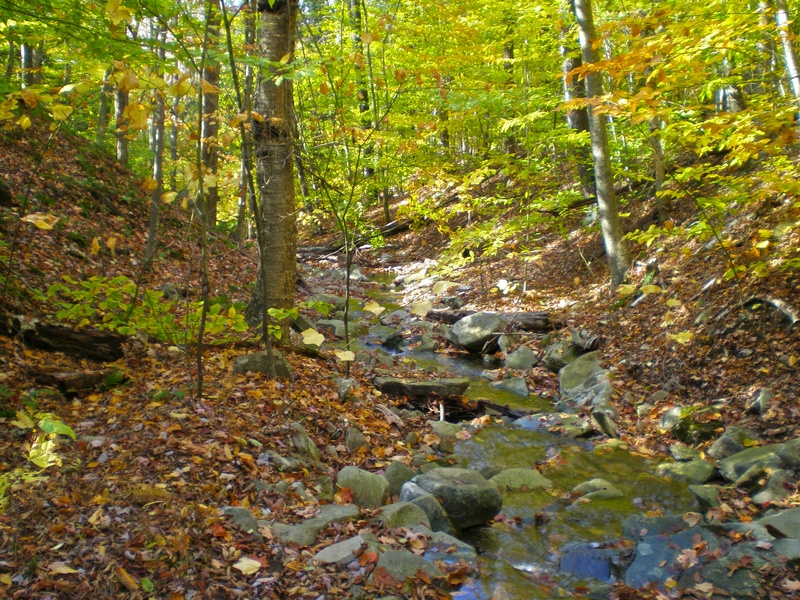 Many large boulders line the creek. Trail Head: Pleasant Stream Road is closed just west of Masten. You cannot take it from Rt 14. You can take Rt 14 to Ellenton Mountain Road to the village of Ellenton, where you can take Masten Road just before the road becomes State Route 1015. 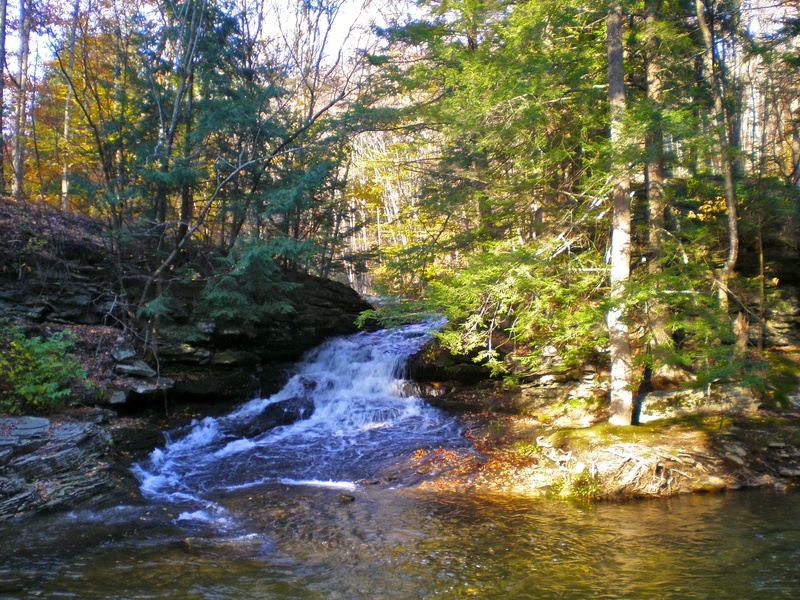 Highlights: The campsite at Rock Run/Yellow Dog Run is one of the nicest I’ve camped at with two gurgling streams and a waterfall. Nice views from Sullivan Mountain and Sharp Top Vista. 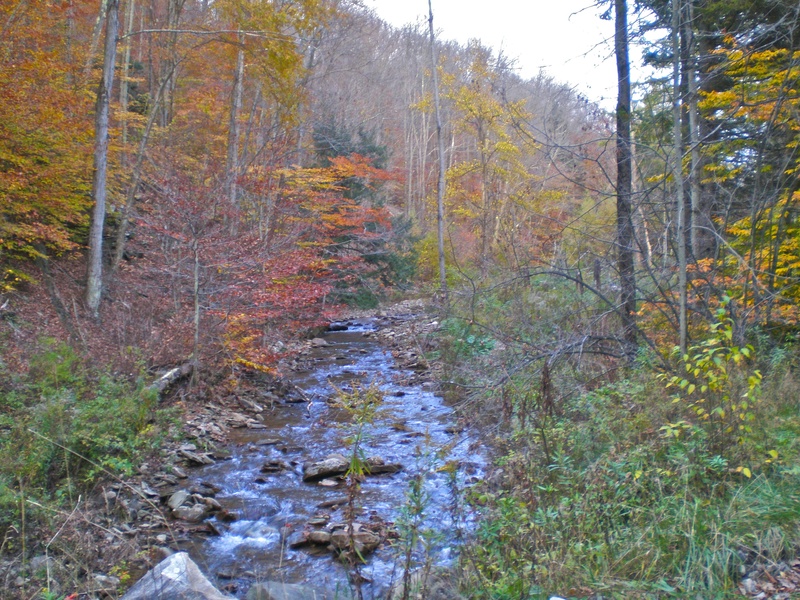 Scenic streams: Doe Run, Pleasant Stream, and Long Run. Notes: There are a number of ways you can do this hike and various places you can park. Masten is the traditional starting point and where we started. We hiked counterclockwise. We did roughly 6 miles the first day to the campsite at Yellow Dog Run/Rock Run, 11 miles the second day and camped on Long Run just before Pleasant Stream Road, and 10 miles the third day back to the car. 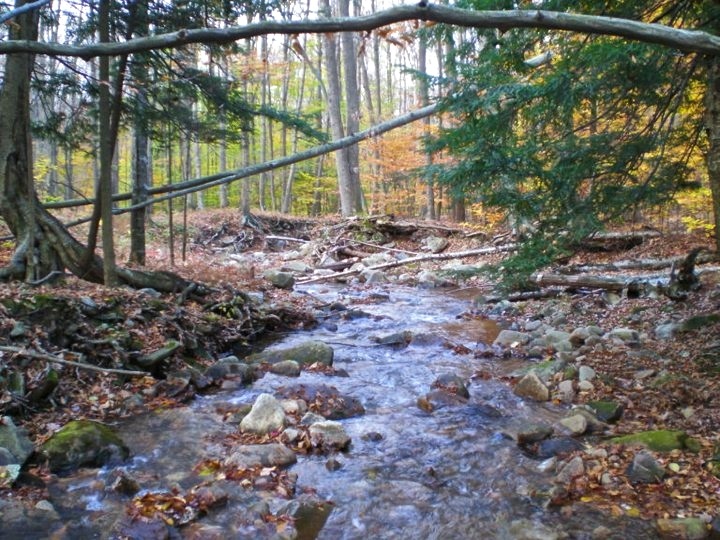 Other possible campsites would be at Doe Run, Pleasant Stream itself (there are a few campsites here), Sharp Top Vista (dry), and Buck Run (which is possibly dry in the summer months/times of low water). 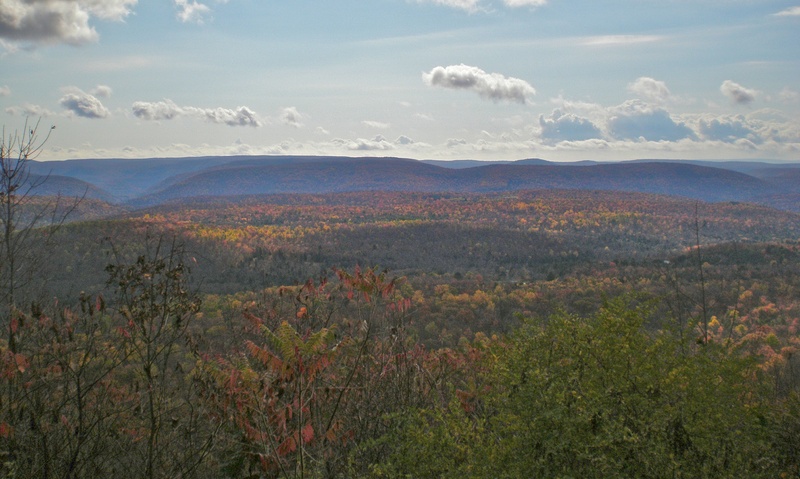 There is a trail that bypasses Sullivan Mountain that would cut a mile or so off the hike, but the views are some of the nicest on the hike on the mountain so we did not take it. You will have to ford Pleasant Stream and your feet will most likely get wet.